Not to be confused with the unrelated province of Hebei. Hubei (Chinese: 湖北; pinyin: Húběi; Wade-Giles: Hu-pei; Postal map spelling: Hupeh) is a central province of the People's Republic of China. Its abbreviation is 鄂 (pinyin: È), an ancient name associated with the eastern part of the province since the Qin Dynasty. It is located at the mid-stream point of the Yangtze River, and its name Hubei means "north of the lake," which refers to Hubei's position north of Dongting Lake. The capital city of Hubei is Wuhan. Hubei borders Henan to the north, Anhui to the east, Jiangxi to the southeast, Hunan to the south, Chongqing to the west, and Shaanxi to the northwest. The high-profile Three Gorges Dam is located in Yichang in western Hubei, as is the Three Gorges University. A popular unofficial name for Hubei is Chu (Chinese: 楚; pinyin: Chǔ), after the powerful state of Chu that existed here during the Eastern Zhou Dynasty. Hubei has served as an important cultural, economic, and political region for China since ancient times until the present. Located mid-way along the Yangtze River, the river along which China's ancient civilizations appeared, Hubei has been a strategic province sought by every new dynasty. In 1911, Hubei played a key role in over throwing the last dynasty, Quig and establishing the Republic of China. During the Communist Revolution, Hubei again played a leading role. With the Three Gorges Dam project under construction, the Hubei region once again is thrust into the center of China's development. By the Spring and Autumn Period (770 B.C.E.-476 B.C.E. ), Hubei was home to the powerful state of Chu. Chu was nominally a tributary state of the Zhou Dynasty, and it was itself an extension of the Chinese civilization that had emerged some centuries before in the north. However, it was also culturally unique, and was a powerful state that held onto much of the middle and lower Yangtze River, with power extending northwards into the North China Plain. During the Warring States Period (475 B.C.E.-221 B.C.E.) 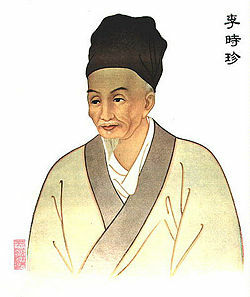 Chu became the major adversary of the upstart state of Qin to the northwest (in what is now Shaanxi province), which began to assert itself through outward expansionism. As wars between Qin and Chu ensued, Chu lost more and more land. First, its dominance over the Sichuan Basin was diminished, then, (in 278 B.C.E.) 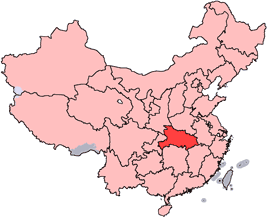 its heartland, which corresponds to modern Hubei, was affected. In 223 B.C.E., Qin chased down the remnants of the Chu regime, which had fled eastwards, as part of Qin's bid for the conquest of all China. Qin founded the Qin Dynasty in 221 B.C.E., the first unified state in China. Qin was later succeeded by the Han Dynasty in 206 B.C.E., which established the province (zhou) of Jingzhou in what is now Hubei and Hunan. Near the end of the Han Dynasty in the beginning of the third century, Jingzhou was ruled by regional warlord Liu Biao. 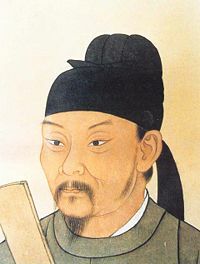 After his death, Liu Biao's realm was surrendered by his successors to Cao Cao, another powerful warlord who had conquered nearly all of north China. In the Battle of Red Cliffs, warlords Liu Bei and Sun Quan drove Cao Cao out of Jingzhou, allowing Liu Bei to take full control of Jingzhou. He then went on to conquer Yizhou (the Sichuan Basin), but lost Jingzhou to Sun Quan, and for the next few decades Jingzhou was controlled by the Wu Kingdom, ruled over by Sun Quan and his successors. The incursion of northern nomadic peoples into northern China at the beginning of the fourth century began nearly three centuries of the division of China into a nomad-ruled (but increasingly Sinicized) north and a Han Chinese-ruled south. Hubei, which is in southern China, remained under southern rule for this entire period, until the reunification of China by the Sui Dynasty in 589. In 617, the Tang Dynasty replaced Sui, and later on the Tang Dynasty placed what is now Hubei under several circuits: Jiangnanxi Circuit in the south; Shannandong Circuit in the west, and Huainan Circuit in the east. After the Tang Dynasty disintegrated in the tenth century, Hubei came under the control of several regional regimes: Jingnan in the center, Wu (later Southern Tang) to the east, and the Five Dynasties to the north. In 982, the Song Dynasty reunified China and placed most of Hubei into Jinghubei Circuit, a longer version of Hubei's current name. Mongols conquered China fully in 1279, and under their rule the province of Huguang was established, covering Hubei, Hunan, and parts of Guangdong and Guangxi. During the Mongol rule, in 1334, Hubei was devastated by the world's first recorded outbreak of the Black Death, which spread during the following three centuries to decimate populations throughout Eurasia. The Ming Dynasty drove out the Mongols in 1368, and their version of Huguang province was smaller, and corresponded almost entirely to the modern provinces of Hubei and Hunan combined. The Manchu Qing Dynasty which had conquered China in 1644 split Huguang into the modern provinces of Hubei and Hunan in 1664. The Qing Dynasty continued to maintain a viceroy of Huguang, and one of the most famous was Zhang Zhidong, whose modernizing reforms made Hubei (especially Wuhan) into a prosperous center of commerce and industry. In 1911, the Wuchang Uprising took place in modern-day Wuhan, overthrowing the Qing Dynasty and establishing the Republic of China. In 1927, Wuhan became the seat of a government established by left-wing elements of the Kuomintang, led by Wang Jingwei. This government was later merged into Chiang Kai-shek's government in Nanjing. During World War II, the eastern parts of Hubei were conquered and occupied by Japan, while the western parts remained under Chinese control. After the defeat of the Japanese in 1945, China was embroiled in civil war until 1949, when Hubei came under the control of the Chinese communists. It played a major role in the establishment of the People's Republic of China, countless revolutionaries from Hubei dying in the revolution. The city of Hong'an in particular is known as the hometown of more than 200 generals, and in Yangxin, over 200 thousand revolutionaries perished in the Chinese revolution under the CCP. The city of Honghu was also an important base for the Chinese communist party in Hunan and west Hubei. Since the establishment of the People's Republic of China in 1949, Hubei has become an important site for economic development in China. The construction of the Three Gorges Dam over the Yangtze River began in 1993 near Yichang, and symbolizes this shift towards economic development in the province. However, in the following years, authorities resettled millions of people from western Hubei, to make way for the construction of the dam. The Jianghan Plain takes up most of central and eastern Hubei, while the west and the peripheries are more mountainous, with ranges such as the Wudang Mountains, the Jingshan Mountains, the Daba Mountains, and the Wushan Mountains (roughly in north-to-south order). The Dabie Mountains lie to the northeast, on the border with Henan and Anhui; the Tongbai Mountains lie to the north on the border with Henan; to the southeast the Mufu Mountains form the border with Jiangxi. The eastern half of the Three Gorges (Xiling Gorge and part of Wu Gorge) lies in western Hubei; the other half is in neighboring Chongqing. 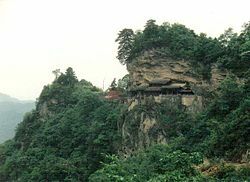 The highest peak in Hubei is Shennong Peak, found in the Daba Mountains and in the forested area of Shennongjia; it has an altitude of 3105 m.
The Yangtze River enters Hubei from the west via the Three Gorges, and the Hanshui enters from the northwest. These two rivers meet at Wuhan, the provincial capital. Thousands of lakes dot the landscape, giving Hubei the name "Province of Lakes." The largest of these lakes are Lake Liangzi and Lake Honghu. The Danjiangkou Reservoir lies on the border between Hubei and Henan. Hubei has a subtropical climate with distinct seasons. Hubei has average temperatures of 1 - 6 °C in winter and of 24 - 30 °C in summer; punishing temperatures of 40 °C or above are famously associated with Wuhan, the provincial capital, which is one of the hottest places in all of China. Map of the location of the Three Gorges Dam, Sandouping, Yichang, w:en:HubeiHubei Province, China and major cities along the Yangtze River. Hubei is divided into thirteen prefecture-level divisions (of which there are twelve prefecture-level cities and one autonomous prefecture), as well as three directly administered county-level cities and one directly administered county-level forestry area. The 13 prefecture-level divisions and four directly administered county-level divisions of Hubei are subdivided into 102 county-level divisions (38 districts, 24 county-level cities, 37 counties, two autonomous counties, one forestry area; the directly administered county-level divisions are included here). Those are in turn divided into 1,234 township-level divisions (737 towns, 215 townships, nine ethnic townships, and 273 subdistricts). See List of administrative divisions of Hubei for a complete list of county-level divisions. Modern rural life in Qichun village, Hubei province, China. Hubei is often called the "Land of Fish and Rice." It is very rich in natural resources, and it ranks as one of the highest provinces in land, water, biotic, mineral and energy resources in all of China. Water resources rank as China's fourth largest and the volume of surface water ranks tenth. As far as crop planting is concerned, Hubei ranks among the best in China. The outputs of grain production, cash and other crops occupy very important positions nationwide, and the province is a strong producer of rice, cotton, wheat, maize, and edible oil. 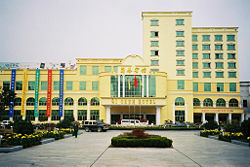 Hubei is also well known for its cash crops such as tea, natural silk, tobacco and fruit. Besides agriculture, Hubei's industries include: automobiles, metallurgy, machinery, power generation, textiles, foodstuffs, and high-tech commodities. Hubei is incredibly rich in mineral resources. Out of the over 110 kinds of minerals found in the province, some of the most important include borax, hongshiite, wollastonite, garnet, marlstone, iron, phosphorus, copper, gypsum, rutile, rock salt, gold amalgam, manganese, and vanadium. The province's recoverable reserves of coal stand at 548 million tons, which is modest compared to other Chinese provinces. Once it is completed, the Three Gorges Dam in western Hubei will provide plentiful hydroelectricity, with an estimated annual power production of 84,700 Gwh. Existing hydroelectric stations include Gezhouba, Danjiangkou, Geheyan, Hanjiang, Duhe, Huanglongtan, Bailianhe, Lushui, and Fushui. The dam is expected to become fully operational in 2009. Hubei's economy ranks tenth in the country and its nominal GDP for 2004 was 631.0 billion yuan (US $78.28 billion) and a per capita of 9,000 RMB (US $1,087). Han Chinese form the dominant ethnic group in Hubei, but the province is home to many ethnic groups living in compact communities. In total, the province has 50 ethnic groups, including the Tujia, Miao, Hui, Dong, Manchu, Zhuang, and Mongol peoples. According to the fifth national census, the ethnic minority groups, (with nearly 2.58 million people), comprise 4.34 percent of the province's total population. Minority ethnic groups with over 10,000 people include the Tujia, Miao, Hui,Dong and Manchu. With 1.8 million people, Tujia is the largest ethnic minority group in Hubei, comprising 80 percent of the total ethnic minority population. The second largest, the Miao, constitutes 10.3 percent. The areas where ethnic minority groups live covers more than 30,000 square kilometers, forming one-sixth of the province's total area. Ethnic minority groups are mainly distributed in southwestern Hubei. On the basis of statistics gathered at the end of 2000, Hubei had 54 schools of higher learning, with 30,363 teachers and 346,568 students. It had 203 special secondary schools, with 15,549 teachers and 278,602 students, and there were 3,261 ordinary middle schools, with 198,486 teachers and 3,509,318 students. In addition, Hubei had 23,372 primary schools, with 274,979 teachers and 6,677,422 pupils. The cultural composition of the population of Hubei has developed to a higher level, which has most sharply manifested in the number of university students (increasing several fold) and the increasing proportion of the educated population. Much of this success can be attributed to the population's recognition of the importance of educational development, and their full understanding of the effect of scientific, technical and cultural knowledge for increasing their overall productive forces. Along with this, Hubei has benefited significantly from the reforms of Deng Xiaoping during the late 1970s, which opened up much of the country to the outside world. With development in various fields of the social economy, new demands have been put on efforts to improve the educational quality of the population, which has helped make Hubei one of the strongest provinces in China in terms of education. People in Hubei speak Mandarin dialects, and most of them are classified as Southwestern Mandarin dialects, a group which encompasses the Mandarin dialects of most of southwestern China. Perhaps the most celebrated element of Hubei cuisine is the Wuchang fish, a freshwater bream that is commonly steamed. Types of traditional Chinese opera popular in Hubei include Hanju and Chuju. The Shennongjia area is the alleged home of the Yeren, a wild undiscovered hominid that lives in the forested hills. The people of Hubei are given the uncomplimentary nickname "Nine Headed Birds" by other Chinese, from a mythological creature that is said to be very aggressive and hard to kill. "In the sky live nine-headed birds. On the earth live cunning Hubei people." 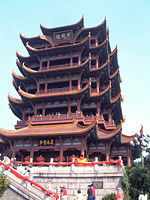 Wuhan, the provincial capital city, is one of the major culture centers in China. 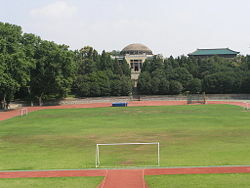 The premier Wuhan University (founded in 1893) and many other institutions in Wuhan also make it a hub of higher education and research in China. Hubei is home to the ancient state of Chu, a local state during the Eastern Zhou Dynasty that developed its own unique culture. Chu (Hubei) culture mixed with other influences, ancient and modern, endows Hubei richly with tourist resources. Ancient towers, grottoes, city remains, imperial mausoleums, temples and nobilities' native places can be found throughout the province. In 1994, the ancient building complex of the Wudang Mountains was listed by UNESCO as a World Heritage Site. Hubei plays an important role in China's transportation industry. Situated on the Yangtze and Hanshui Rivers, which are important waterways, Hubei also enjoys the convenience of railways linking Beijing to Guangzhou, Beijing to Kowloon, Shanghai to Wuhan, Wuhan to Chengdu, and Zhicheng to Liuzhou. Hubei also has several airports, located at Wuhan, Yichang, Sanxia, Xiangfan, and Shashi. National and provincial highways are fairly well developed, demonstrating Hubei's strong level of economic development. All links retrieved January 17, 2018. A trip to Lake Liangzi. The Ancient Building Complex in the Wudang Mountains at the Unesco World Heritage List. This page was last modified on 17 January 2018, at 16:00.